The man who wrote these words saw his mission in life as much bigger than just making a best-selling soap, as the new movie Dr. Bronner’s Magic Soapbox, now screening at Jewish and other film festivals in the United States and Canada, demonstrates. Long a counterculture favorite for its natural ingredients and mind-bending philosophy, Dr. Bronner’s soap sparked Los Angeles-based filmmaker Sara Lamm to explore the stranger-than-fiction story behind the soap and its eccentric creator. That story began in Germany, when Emanuel Heilbronner often felt like an outcast. In a taped conversation included in the film, he describes the first time his German classmates called him over to play with them, only to dump a pail of urine on his head and call him a “damn Jew.” By 1929, he had had enough and escaped by deciding to create a new life in America. He later urged his family to make the same move, warning them of the danger of Hitler. They declined, and the last he heard from them was a heavily censored postcard with the phrase “you were right” about the only part not blacked out. Soon the Nazis forced his father to sell his soap factory to the state, and both Emanuel’s parents were arrested and killed in concentration camps. In America, the fourth-generation master soapmaker had dropped the first part of his surname (as a protest against “Heil” as a Hitler slogan) and found work as a chemist. After his wife died in 1944, he swore he would “become a servant of God,” noting the Hebrew translation of his first name (“God is with us”). For him, that involved creating a “Moral ABC,” a rambling and bizarrely worded teaching he claimed originated with Rabbi Hillel. And he began cramming his soap labels full of these and other writings. The labels cite Thomas Paine, Rudyard Kipling, George Washington and, for some reason, 1972 Olympic star Mark Spitz; claim the coming of Halley’s Comet produced an important prophet on each visit; and repeatedly stress a need for all mankind to unite in an “All-One-God Faith.” In the film, Lamm asks fans of the soap to interpret the label; nobody can do so easily. Bronner regularly railed against both Nazism and Communism in his public speaking (and on the soap label), and that sometimes took extreme forms. Lamm’s film includes FBI reports documenting that Bronner would call its office daily, claiming fluoride in America’s water was a communist plot. He regularly wrote the President and recorded many hours of audiotape extolling his theories. While speaking at the University of Chicago in 1947, Bronner got into a heated argument with the dean over his lack of a speaking permit. (In the film, his daughter-in-law speculates that Bronner’s tendency toward intense speech probably made things worse.) He was arrested and committed to an insane asylum in suburban Elgin, Ill. where he performed manual labor and was given electroshock therapy – the damage later rendered him blind. He soon escaped the asylum and started hitchhiking, ending up in Los Angeles. There he reopened his soap business, initially using an abandoned tenement house as a factory and sleeping on the floor amid the barrels of ingredients. He later opened his own factory on a large plot of land in Escondido, Calif., which became almost as well known as a destination for spaced-out hippies as for its soap. As the counterculture grew in the 1960’s, the hippies embraced Bronner. Both for his soap – which was vegetable-based, organic, unusually sudsy and designed for a variety of uses – and for his colorful persona and cosmic beliefs. For all his success as a speaker and soapmaker, Lamm’s film also shows Dr. Bronner’s less-than-stellar record as a parent. His children were often left in foster homes as he traveled around, as Bronner argued, “what is more important – uniting Spaceship Earth or raising your own family?” He usually opted for the former. According to his grandson, Bronner – an ardent Zionist even as a teen – modeled the soap label’s blue-and-white colors on the Israeli flag. And he regularly referred to himself as a rabbi, while criticizing other rabbis for not teaching the “All-One-God Faith.” But his children say they never knew they were Jewish until they were older, and that Bronner favored his blond, blue-eyed son Jim over the more Jewish-looking Ralph. They attribute it in part to the negative reaction to being Jewish in his childhood. Lamm’s film, which is available on DVD through her Web site, tells this story with an outstanding mix of interviews and archival footage, and is often as much about Ralph as it is about his father. 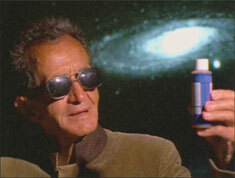 The affable Ralph is now the public face of the Dr. Bronner’s company. He also performs a one-man show about his father and travels the country giving away soap samples and sharing his dad’s story. The film captures Ralph meeting strangers in newsstands and hospices, and getting them to open up to him with his talkativeness and disarming approach. Despite its multimillion-dollar revenues, the company still tries to carry out Dr. Bronner’s vision of helping all people. It gives about 70 percent of its net profit to charities from the Boys and Girls Club to sustainable development projects in sub-Saharan Africa, and also caps executive pay at five times that of the company’s lowest-paid employee. The soaps remain organic and fair trade with no animal testing, and the company is now using an organic olive oil mixed with both Palestinian and Israeli oil as past of its “All-One” message. Magic Soapbox is moving in its exploration of the disconnect between Bronner’s ultra-idealistic worldview and the trauma of his personal life and the lives he created for his children. Lamm treats her subject seriously, letting Bronner’s more bizarre traits speak for themselves, and the result is a film that’s sometimes funny or depressing, but interesting throughout. “With Dr. Bronner, there’s the great question that many people who look at the bottle ask, ‘is this a crazy person? '” Lamm says of Emanuel Bronner, who died in 1997. “And the tension between a crazy person and a visionary, in Dr. Bronner’s case, is very clear and was very interesting to me. Jeff Fleischer is a Chicago-based journalist who has written for publications including Mother Jones, The Sydney Morning Herald, The New Republic, Mental Floss and Chicago magazine.